Upwards and Downwards Tilt Mechanism. Telescopic arrangement for adjusting full height. Offering a perfect blend of form and function, Orient Floor Supreme stand fan makes for an excellent addition to any contemporary setting. This stand fan has an attractive round metal base with wheels to offer extra stability and easy manoeuvrability. 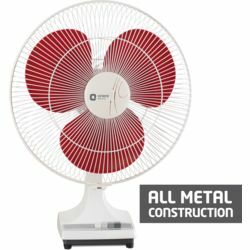 Other features and specifications include acute angled aluminium blades for providing high air thrust, noise free operation, powder coated guard and polymer ring, fan head tilt mechanism, and motor protection through thermal overload protection device. Offering a perfect blend of form and function, Orient Floor Supreme stand fan makes for an excellent addition to any contemporary setting. 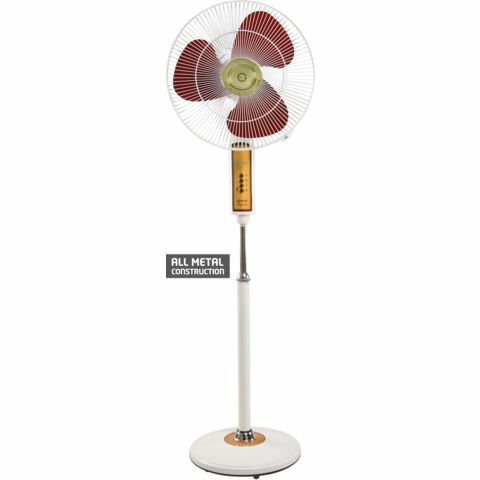 This stand fan has an attractive round metal base with wheels to offer extra stability and easy manoeuvrability. 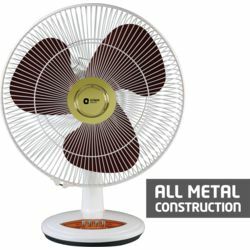 Other features and specifications include acute angled aluminium blades for providing high air thrust, noise free operation, powder coated guard and polymer ring, fan head tilt mechanism, and motor protection through thermal overload protection device.